Posted April 30, 2014 by Mike Mercer & filed under History, Mexico. The Mexican serape has been popularized in many Western films, but unlike the dull gray serape that Clint Eastwood was often seen wearing in the famed Spaghetti Westerns of director Sergio Leone; the more traditional serape is brightly colored. Today, the serape, like the sombrero, has become a symbolic icon, that people the world over immediately recognize and correlate with Mexico. In 1519, when Hernán Cortés arrived in Mexico, the Aztecs were wearing blanket garments made from a mixture of cotton and agave cactus fibers, and dyed using organic materials, such as crushed fruits and insects. The Aztecs believed that wearing bright colors would bring favors from the gods, while warding off any evil spirits. The intricate patterns and designs were originally used to identify one’s family or social status, as well as which hometown or region the wearer originated from. 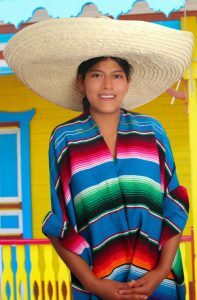 Serapes were originally worn by men, while women would wear similar woven blanket-like garments called rebozos or huipiles. The introduction of the fabric pedal loom, along with domesticated sheep for wool production, from Europe, into Mexico, made a long lasting impression on the production of serapes. From the early 1800s, through the early 1900s, the hand-woven wool serapes were most common, but by the 1930s, the machine-woven serape had become the norm. Today, most serapes are made using synthetic acrylic and cotton materials. Serapes produced before the 1880s are especially difficult to find today and are valued not only for their historical significance, but also as works of art and for their outstanding craftsmanship. While the serape got its start as utilitarian garment for farm laborers, it has widely been used amongst many different social classes, including Mexican nobles who would drape colorful serapes over their shoulders while attending social events. The multi-function serape has long been used for many different purposes, including; a place to sit down, sleeping mat, pillow, shoulder wrap, poncho, horse blanket, room divider, doorway cover, furniture throw, table cloth, window treatment, rug, wall hanging, and more.